The Robinson Crusoe Island is a secluded place that caters specifically to the budget conscious traveller who is looking for a great Fijian experience whilst still getting real value for money. Families will love the fact that you can have the kids kept entertained with a range of fun cultural actitivites whilst the parents catch up on their relaxation by the lagoon. Couples and backpackers will enjoy the sumptous island feasts and nighttime entertainment that the resort provides as well as the array of other activities that are on offer including snorkelling, sea kayaking, fishing, diving and numerous other water sports. When you stay at the Robinson Crusoe Island resort you can even experience a range of day and night tours which are full of adventure, entertainment and of course great local foods. Robinson Crusoe Island is a 25 acre island that lies in calm waters only 10 minutes across the bay from the main Fijian island of Viti Levu. 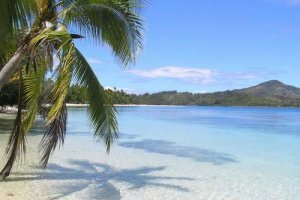 Located along Fiji's Coral Coast just 40 minutes drive from Nadi airport Robinson Crusoe Island is accessed via a boat cruise that takes you along the river for 30 minutes and then on the small trip across the lagoon to the island. You can click here to see all Robinson Crusoe Island Rates & Availability. If you want hotel and/or resort accommodation on Robinson Crusoe Island at cheap rates for your next holiday then Holidays Fiji is the place for you. We give holiday travellers the ability to compare a range of hotels, resorts and apartments at the same time, thus making it easier for you to decide where it is that you want to stay. So book your accommodation at any of the Robinson Crusoe Island resorts with confidence, and even take advantage of the cheaper rates for longer stays.